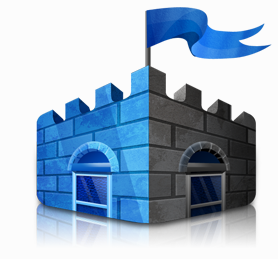 Microsoft have just announced they will allow small business with less that 10 seats to use Microsoft Security Essentials for free. 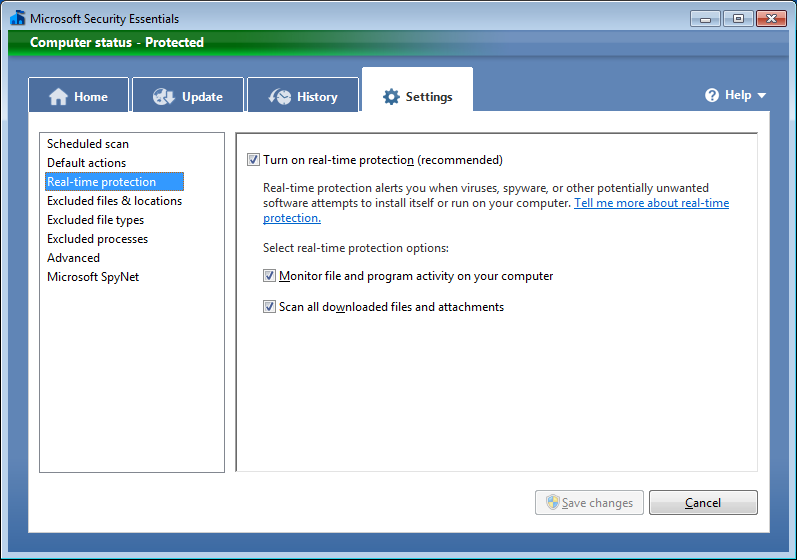 But even having to configured 10 copies of Microsoft Security Essentials (MSE) can be a pain so below is a quick tutorial on how you can Group Policy Enable Microsoft Security Essentials. 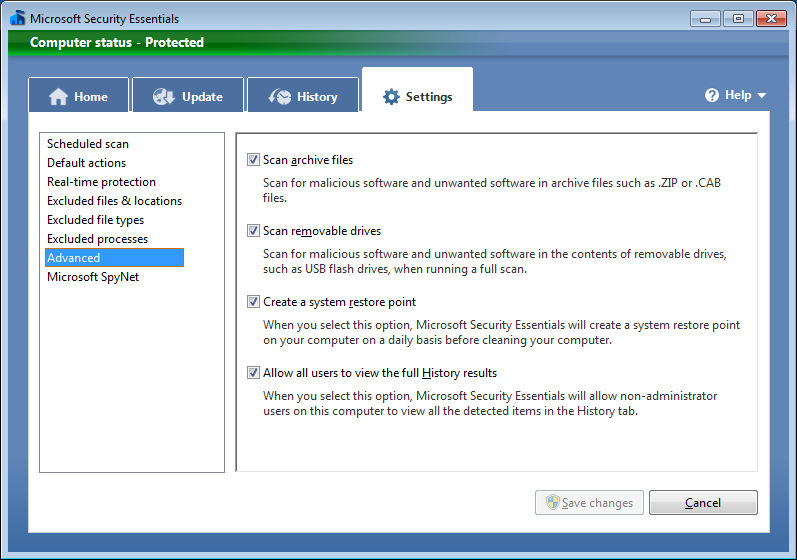 Update: Microsoft have now updated their Microsoft Security Essentials web site to say small business can now “officially” use MSE. 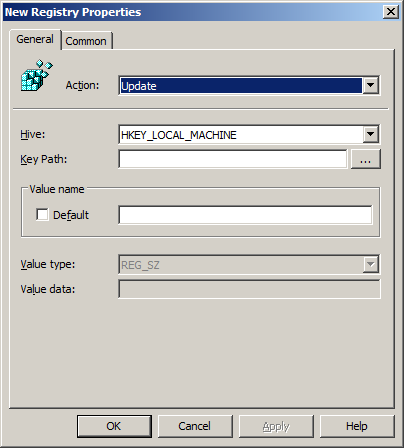 Before we begin I want to be clear that MSE does NOT natively support group policy this is simply a way to configure the registry keys of the application using the Group Policy Preferences Registry key setting. Note: If the below instructions to create the registry keys seems like to much work you will be glad to know that I have put a link at the bottom to an XML Group Policy Preferences Registry file. 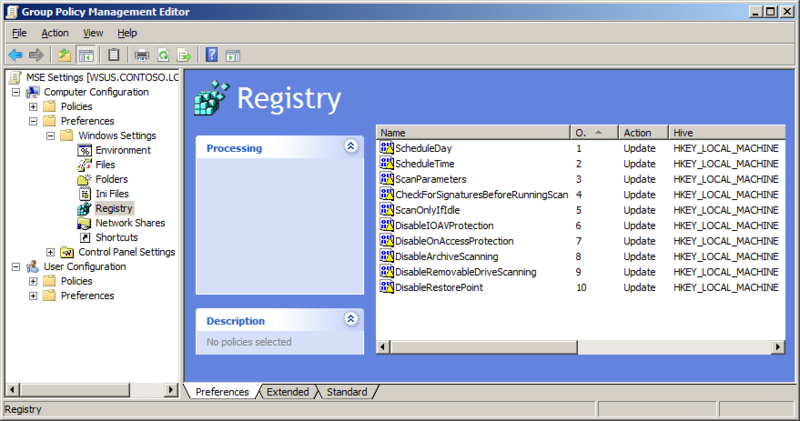 You can use this file to import the all the Policy Registry setting I talk about below automatically. 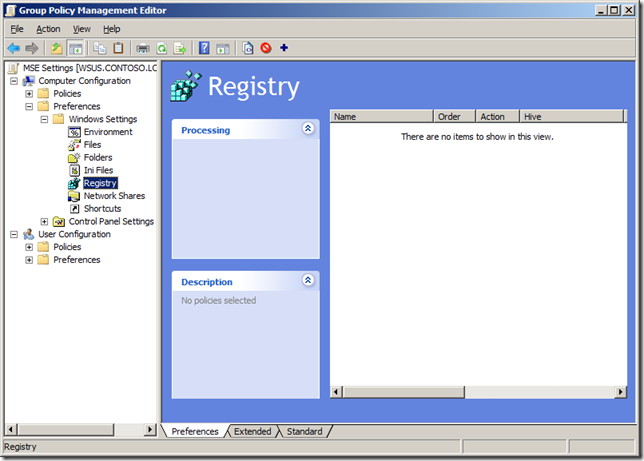 How to use Group Policy Preferences Registry key setting. Before we begin we first need to know how to create a Group Policy Preferences Registry Key setting that we will use to control each of the registry keys we need to configured MSE. The following steps will need to be repeated for each registry key below. Step 1. 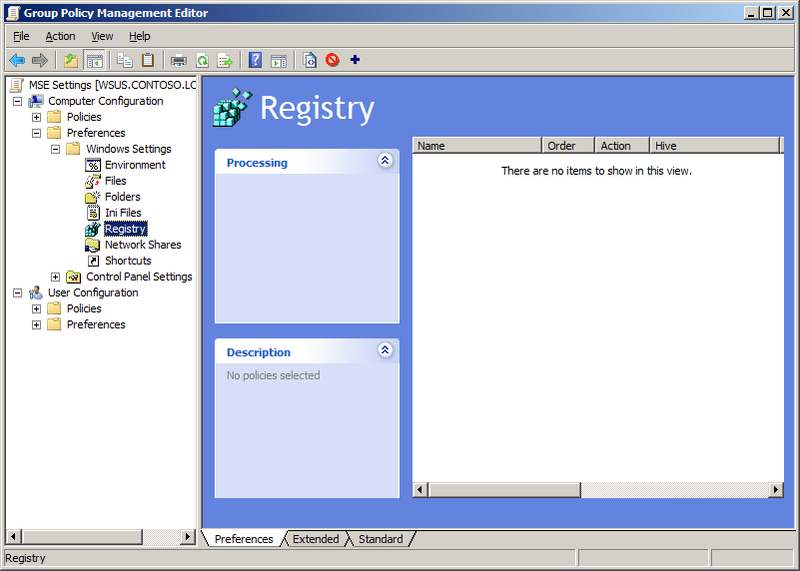 Edit a Group Policy Object that is applied to the computers you want this setting applied. 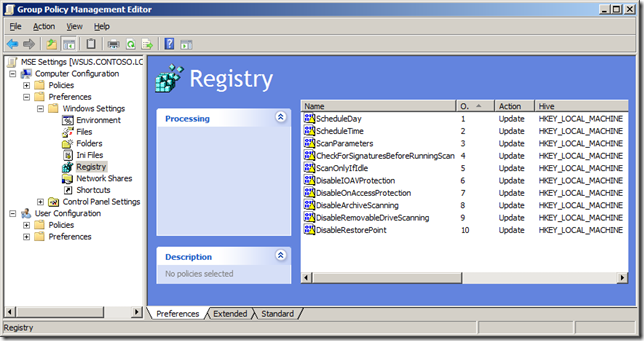 Now you know how to configure a registry key setting using Group Policy Preferences you can create a new Registry Item for each registry key listed below. Note: The Data values below that are highlighted in BOLD are the values you need to use to replication the examples shown. 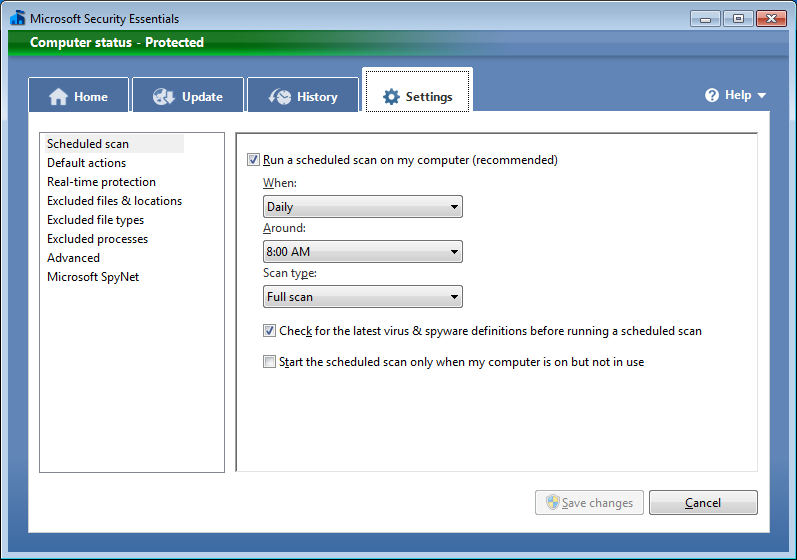 Now all your computers will have the scheduled scan option configured as the following image below. 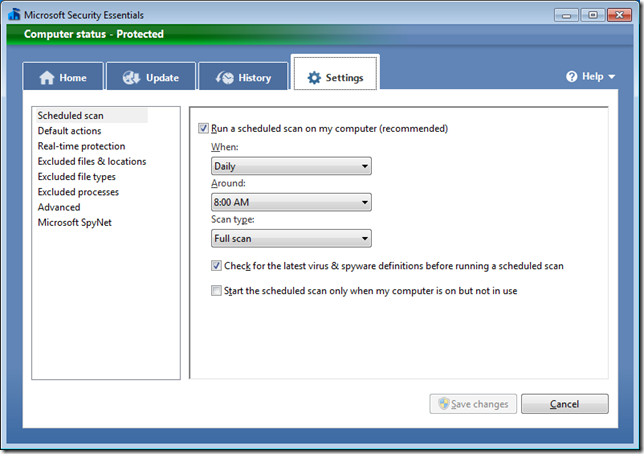 Below are the registry keys for configuring the “Rea-Time Scanning” settings for Microsoft Security Essentials. You real time protection should now be configured as shown below. 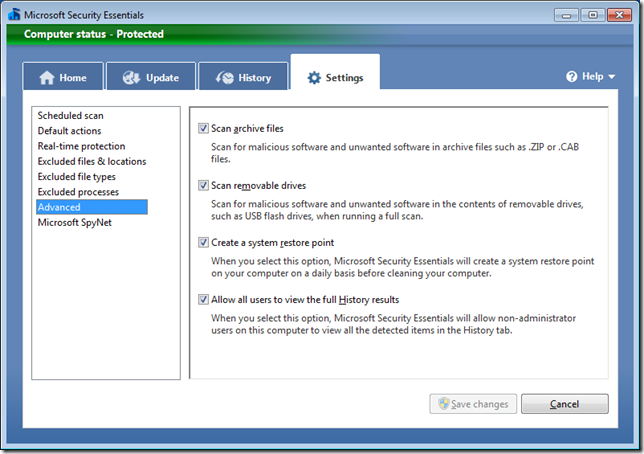 Below are the registry keys for configuring the “Advanced” settings for Microsoft Security Essentials. For your convenience I have provided you a link to a XML Group Policy Preferences Registry file for all the above settings. Simply save the file to your desktop and then drag it into the empty pane on the right hand side, click “Yes” to confirm the import and you will have all the registry keys automatically created. Is there any method of pointing the client to an update folder on the LAN rather than each one updating via the internet? Or that the update be manually downloaded and saved to a common mapped folder? In this article the description is very clear and helpful. It describes everything clearly. I enjoyed the article very much. I also have read a article about this topic here “http://www.techyv.com/article/group-policy-essentials-2003-2008” which is very helpful also. Hi Alan – thanks for an excellent article and GPO Preferences file. Very useful for preventing endusers from modifying settings by accident. How can I get other REG_DWORDS for MSE? Specifically I would like to disable the settings tab to users..
How am I able to configure the settings for automatically deleting quarantined files using regedit?